An alternative to an elevator or vertical platform lift, the Omega requires minimal construction. The Omega inclined platform lift is designed for access over stairs with multiple levels, curves or intermediate landings. 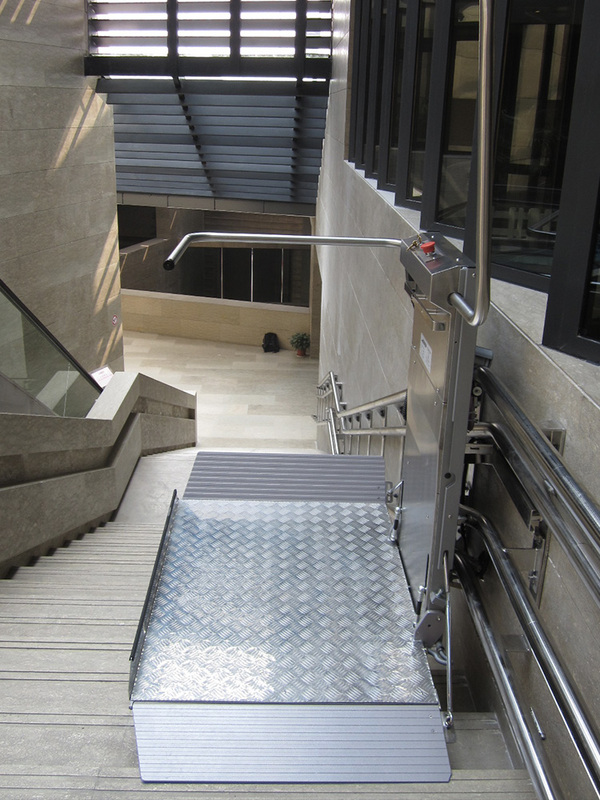 This lift carries a passenger with wheelchair up and down stairs by travelling along a rail system mounted alongside the stairs. Foldaway platform allows full access to the stairs when the lift is not in use. Custom built to your specifications – can accommodate curved and spiral stairs, indoor or outdoor, multiple levels, etc. Available ADA-compliant platform includes a fold-out seat and audio visual movement alarm to meet public building access requirements. Have your Freedom When You Invest in a Home Wheelchair Lift. If you think a residential wheelchair lift will allow you to remain safe and independent in your own home, set up a free in-home evaluation and demonstration. We will provide a no-obligation quote. Our installation staff is factory-direct trained and licensed by the State Department of Consumer Protection and the State of Rhode Island Department of Labor. There’s no sales nonsense – just plain facts and great pricing. Discover why more and more people are buying wheelchair lifts from Freedom Lifts, a trustworthy, locally owned and operated company.